Next week a new policy will come into effect, which will ban any U.S. Marines from getting tattoos. The Marines are banning any new, extra-large tattoos below the elbow or the knee, saying large tattoos are ruining the image and professional deportment of the Marines along with the traditional values and the high standards America expects. This policy has not come as good news for many Marines like Cpl. 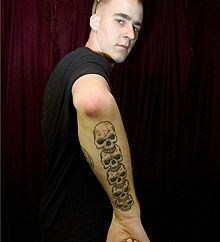 Jeremy Slaton who wear five skulls tattoo from right elbow to his wrist, spelling out the word “Death’ and had planned to add a tattoo spelling “Life” on his left arm, but that’s on hold because of this policy which taking effect on Sunday, April 1st. US Marines are not first to do so as some branches of the military have already banned offensive or disruptive tattoos.